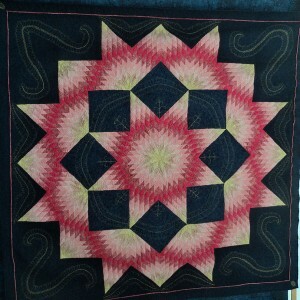 Daphne’s ‘However Did That Happen’ quilt is one of 12 quilts she is making for her 12 grandchildren. She talks about how she starts with a medallion in the centre and then builds her design from there. Daphne also discusses how she has needed to learn how to machine quilt, after arthritis meant she struggled to hand quilt. Jan Allston [JA]: [Interview introduction] Good morning Daphne. Daphne Barker [DB]: Good morning Jan.
JA: First of all, can you tell me about your quilt and can you describe it? How big is it? 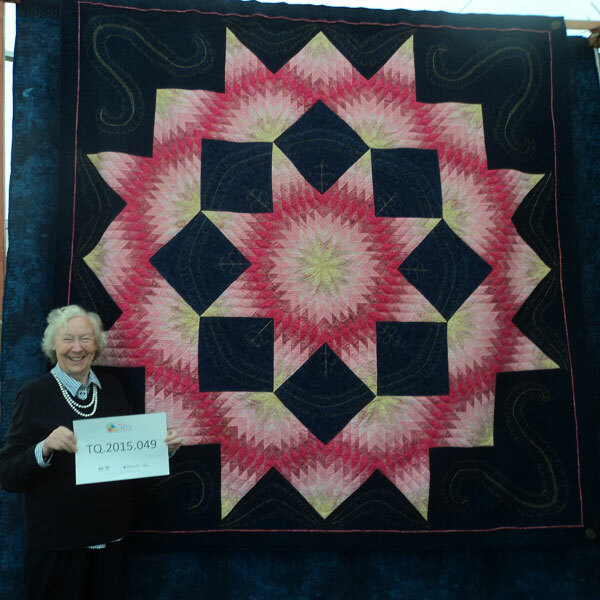 DB: The quilt is approximately about 110 by 110 [inches] and it is of course made of all cottons… it, when I was in America on a Judy… size, colour, pattern, fabric… well it’s 112 by 112 in dark blue and bright pink and it’s an ordinary broken star pattern, the old-fashioned design and it’s cotton. And its machine pieced. And the quilt is one of 12 I’m making for 12 grandchildren which will be left for them after I’ve not there – always supposing I make 12, I’ve only got as far as five so far. JA: And is this one for anyone in particular? DB: No, I’m making anything I feel like and they can fight over them. JA: Right, ok. What do you feel about this quilt? DB: Shocked. It wasn’t what I meant to make. JA: Right, ok, and what did you mean to make? JA: Thank you Daphne. It’s quite a big quilt. Do you normally make big quilts like this? DB: Yes, I always make a bedspread size. The idea is to make 12. I’ve been making them for years, as wedding presents. Most people I know have now got married so I turned my attention to my 12 grandchildren, for whom I’ve always made baby quilts – Wind in the Willows, Winnie the Pooh, things like that – they’ve all still got them but they’re now outgrown. So I thought I would make 12, my choice, I don’t have to say ‘What colour would you like?’, I can do anything I feel like. JA: And have you used, what wadding and backing have you used on it? DB: On that one mostly I try to use wool because it’s lighter and it gives a nice puffy finish, so I prefer wool unless of course it’s a white background when you have to go to white polyester or something not to show, or a dark one of course, so it’s, and there again because it was pink and gold I used gold thread as well as the dark blue thread. JA: Is it hand quilted? JA: Is it the same quilting all over, have you used different quilting stitches? DB: Err… It’s all, it’s all, it’s all machine quilted, the navy, the blue part is mostly just meander and so on, the gold part is the bit you’re meant to notice and that’s feathers and squiggles. JA: So when did you first start quiltmaking? DB: In the seventies, as my children grew up and there’s lots of fabric around like most quilters, they used it for something. I’d always wanted to do something like that but in my day if you were good at lessons you weren’t allowed to go and sew, so I used to sneak into the sewing room late at night and do little bits and as soon as I left school I started trying to put bits together and the only book available was Avril Colby, so I did it! 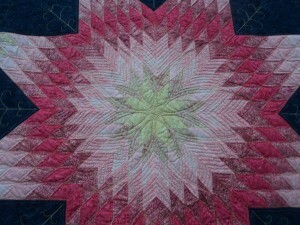 And it was very hard to hand quilt because the fabrics were heavy, mostly Laura Ashley, and it’s very hard on the hands. JA: And what kind of quilts did you make when you started? DB: It’s always been bedspreads, [JA: Always been bedspreads] always been bedspreads, because I don’t like to make anything I can’t see an end use for. 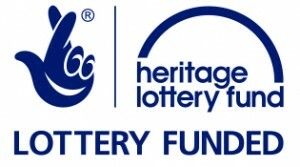 So some of them are now tablecloths and I do wish I had known when I was young that you could use a quilt for a tablecloth and it wouldn’t need ironing and I wouldn’t have wasted all those hours ironing Irish linen tablecloths, and starching them. And now quilts just go straight back on unironed and that’s great. JA: Are there any other quiltmakers in your family? DB: No, no, nobody sews. JA: So what made you sew, apart from, you know apart from at school? DB: I cannot imagine. My mother couldn’t see it either. It’s just, it’s colour, it’s colour. I’ve always wanted, spent hours rearranging pencils in a box, you know, colour grading and, and threads and everything like that. I’m a sucker for just buying different colours. JA: What are your preferred styles or techniques? DB: Well I stick mostly to the traditional patterns which you might rearrange. I could spend hours trying to rearrange a pineapple into different… I expect we’ve all tried that. That’s fun just to try to make it slightly your own but it’s still the same traditional pattern. So I suppose I’m just a traditional quilter. JA: So have you done any foundation piecing or appliqué in your work? JA: And what do you enjoy about your quiltmaking? What do you enjoy most? DB: Well I think the best bit for most people is just getting the colours out and trying to play with them. And, like in my pink and blue one, they don’t always lead you where you had planned to go but that can be interesting too. There’s so much available now to choose from that you really are lost in it and most of us have got huge stashes so there’s always something. JA: What do you like least about quilting? Is there anything you don’t like to do? DB: Putting the binding on because that’s hand work and the hands are no longer quite as efficient as they were. JA: What technology do you use if any in your quiltmaking? DB: No particular, such as embroidery machines, no just an ordinary, and ordinary sewing machine. JA: You don’t use a computer or anything like that? JA: So you’re very very traditional then? JA: Ok, where and when do you quilt? DB: Well now I’m much older I can do it whenever I like. I have a small 12 by 8 size glass building off the house which my husband put up for me and that has my office desk for running the horses and a computer and two sewing machines and that’s about all there’s room for and it has a huge window out onto the yard so that I can see what the children are doing and be sewing at the same time. And when I get stuck I turn to the computer and play patience on the computer. JA: How do you, how do you go about making a quilt? How, what sort of order do you do things in? DB: Well mostly I plan to make a medallion quilt so I start in the middle and very often I have no idea where the outside is going. But since I learnt to do free-motion quilting feathers and things I always try to have some open space somewhere so that is part of the plan. Doesn’t always work like that but that’s the idea. And very often when I come to the outside I haven’t got an idea but there are so many possibilities that something happens. 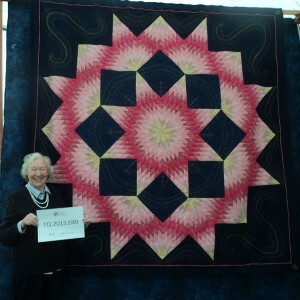 JA: Quite a lot of your quilts are quite big. I mean how long does it take you to make a quilt that size? DB: Well these days I look to try and do two a year because it was once one a year when I was hand quilting cos that took a long time. These days it’s, it’s quicker. I don’t watch television so I don’t sit and sew in the evenings, so it’s all done during the day. But I am trying to run 40 horses as well so I’m up and down, up and down all the time sorting the yard out. JA: What do you spend your money on, for your quilting? DB: Fabric [laugh] and thread. On my, I’m a sucker for the colour of thread, I’ve got huge quantities of thread, I probably don’t need, but then again like fabric it’s always nice to have it there because eventually it’s that one piece you need. JA: Do you have any favourite fabrics? DB: I like batik, you know, but then I’ve got a large batik collection and then you, after a minute you think perhaps you’d like to go back to the old florals or something so you swing across. JA: And how about thread? Do you have any particular thread you prefer? DB: I mostly use Superior threads because, again, because I’ve met him, I know it, and I’ve got used to them. DB: Well, he was, in the early days he was often on the stand selling, and he’s a nice bloke. He used to let English buyers off the sales tax, which of course made me remember him! JA: What was his name? DB: His name was Bob something. JA: Right, we’re moving on to the craftsmanship and design in quiltmaking section now. What do, what do you look for, or what do you notice in other people’s quilts? JA: And what do you think makes a good quilt? DB: Colour. 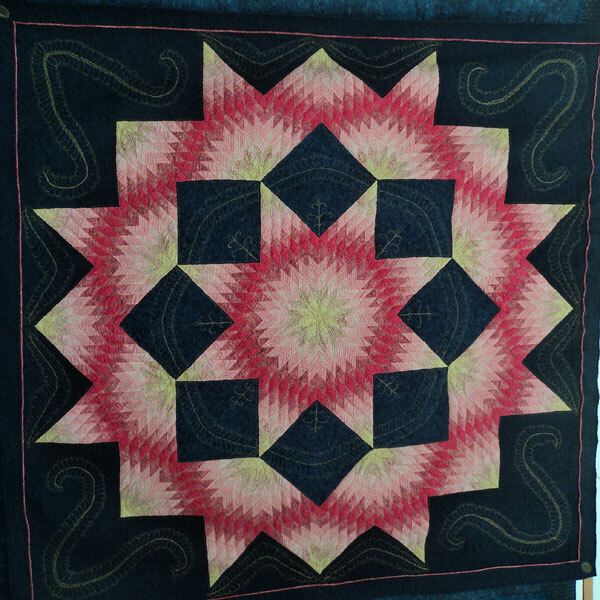 I look for the things that I enjoy doing I suppose, so I like the ones that are quilted – not, not thick heavy quilting, but enough so you can see it. And of course unfortunately if you want your feather to stand out you have got to back it with some sort of stipple or background or otherwise it doesn’t stand out, so it’s vicious circle really. JA: What do you think [pause] sorry, where do you get your ideas and your inspiration from? DB: Other people’s, magazines, books, just a desire like in the last one, to have a better go at making a star and see if you could get it right. I like foundation piecing, so often there’s a foundation pattern that is a fun to do… but I always try and turn it into a medallion-style because that’s the way I think so they get re-arranged so there’s a centre part. JA: Lovely [laugh]. And how do you, how do you feel about either hand or machine quilting? Do you have any, any thoughts about those two? DB: Well I’ve spent hours and hours and hours of really happy hand quilting for years watching television and so on but after a while as you get older you can’t do the hours and hours and then if when it starts to hurt it’s frustrating so I thought I’d better learn to machine quilt and it took three long hard years. DB: It’s not as easy as they said, and in the end I just thought well you’ve got to get out and make things because doing little samples doesn’t get you anywhere. So I started making quilts, most of which are now in the dog-bed, or something, and in the end it sort of came so now I can more or less do what I want to do… and then I go and look at the longarm patterns and try and adjust them towards a home machine. JA: Do you find it easy to use it on a home machine? DB: Yes, I’ve found it very easy. There is now a ruler foot available in Australia that you can put on, so that you can actually sew alongside a ruler without breaking the needle and going onto the ruler and that’s wonderful. JA: What do you do with the quilts you’ve made? DB: Well up till now they’ve all been made specifically as wedding presents but most, now being nearly 80 most of the children I knew that I was making presents for have gone past the marriage stage so I then thought I have 12 grandchildren, I shall make 12 big quilts, not for anyone specifically just anything I feel like making and they – there are only five so far – they go into a cupboard and they will wait until I… the first, they won’t get them till they marry and as these days the young don’t seem to marry they might wait a very long time. But the idea is that they will all get one and if they get one they don’t like I’m sure they can sell it on eBay because you get quite a lot of money for that sort of thing, and then they’ll have something. 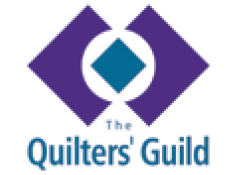 JA: What, what do you think is the biggest challenge that you face as a quilter today? DB: Personally my challenge is always to try and get it square and smooth, not baggy in the middle and it’s not a challenge I succeed in very often. I get it square and then it’s baggy and if I get the baggy bit out, it’s not quite square, because it is very big and hefting those big ones around is, is, you can’t spread it out cos nobody has a floor that, and anyway I’m too old to go down on my hands and knees, so I’ve got tables on the deck outside so you are limited to when the weather is suitable and you spread it out and hope for the best. JA: And finally Daphne, why is quiltmaking important in your life? DB: I would find it very difficult to think of life without it, I really would. It’s just… you can go back in there and do a bit or just think about it or just look around at your stash – that makes you feel good… it’s my life, apart from horses! JA: Well thank you very much Daphne, that’s a most interesting interview we’ve had today and I look forward to seeing the transcript and a bit more about it on the Talking Quilts, their website. Thank you very much indeed.